As amateur quarterbacking duels go, Thursday’s semifinal clash between Oregon’s Marcus Mariota and Florida State’s Jameis Winston is a transcendent matchup — Heisman winners have faced off only two other times, always with the national championship at stake — and like all transcendent matchups, it’s hard to shake the impulse to size up the protagonists based on anything except football. After all, when we get down to it, doesn’t the Heisman-vs.-Heisman narrative sort of, you know, cancel out? News flash: Both quarterbacks are really good. Cue the voice-over, roll the highlights. Let’s get it on. Meanwhile, the conflict of personalities sits there, ripe for the narrative picking, compelling in the grand allegorical tradition of Ali vs. Frazier, Lakers vs. Celtics, and Catholics vs. Convicts. Mariota, the quiet, even-keel veteran, versus Winston, the volatile, boom-or-bust phenom; Mariota, the earnest boy your parents hope you bring home for Christmas, versus Winston, the proverbial lightning rod whose every move is accompanied by an asterisk that, fairly or unfairly, binds him to a cultural moment absorbed by official responses to violence against women. Put them together in a sepia-toned setting like the Rose Bowl — the Granddaddy of Them All, where the setting sun casts its indelible shadow over the fourth quarter like a great celestial stagehand, etc. — and millions of people who couldn’t care less about Oregon or Florida State football might be made to care about the collision of two ready-made archetypes facing off on such a stage. On that level, the X’s and O’s seem almost incidental. In fact, when I initially pitched this article as a “Tale of the Tape”–style breakdown, I was thinking in terms of a stalemate that would as likely as not be broken by a lily-livered category like “intangibles.” Alas, if only sating America’s desire to see FSU and its embattled headliner go down in flames was that straightforward. As it turns out, the more closely one examines the nation’s most valuable, high-profile quarterbacks from a strictly analytical football perspective, the harder it is to take anything on the field for granted. True, on paper it’s not even a contest: Mariota has outpaced Winston (and everyone else) this season in every major statistical category, and by fairly wide margins. But uninspiring numbers from their star haven’t been enough to keep the Seminoles from winning every game en route to the playoff, and they certainly aren’t enough to diminish Winston’s prospects for a breakthrough against the Ducks. The real question is more subjective, pitting Winston’s enormous, maddening potential against Mariota’s startling consistency: With a national championship game berth on the line, is it more valuable to have a high ceiling or a high floor? 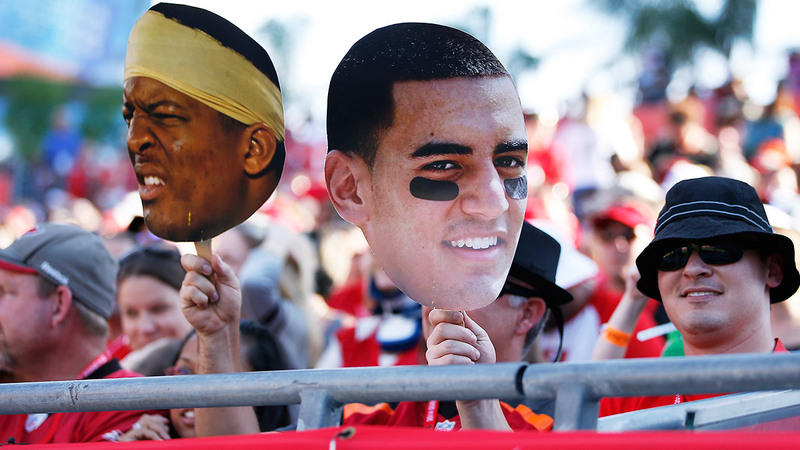 Listen, I can’t tell you how badly I’d love to be the lone dissenter in the Mariota chorus, if only to break up the monotony.1 But even my most iconoclastic instincts are no match for the campaign this guy delivered: Expectations coming into the season were sky-high (Heisman Trophy, Pac-12 championship, playoff bid, the whole enchilada) and so far he’s delivered on every count. He leads the nation in pass efficiency by a mile and boasts a touchdown-to-interception ratio of 38-to-2, and he effectively serves as the Ducks’ backup running back. Every time I write about Mariota (see here and here, for example), I go in looking for Kryptonite and come away singing the same praises as everyone else to his versatility and consistency. NFL scouts, who’ve turned skeptical nitpicking into a high art, have resorted to wondering aloud if Mariota is too laid back. That’s about as damning an assessment as you’re likely to find. Before we get to the lone blemish, look at the highlighted games against the two best defenses on the schedule, Michigan State and Stanford, both of which finished among the top six nationally in yards per game allowed. Opposite Mariota, they were indistinguishable from the scrubs. Against Michigan State, Mariota was 85 percent more efficient than the average Power 5 passer was against the Spartans over the rest of the season, an outrageous gap even for him, and he personally eclipsed the yardage the Spartans typically yielded to entire Power 5 offenses. Against Stanford — which, remember, was widely regarded as Oregon’s nemesis after staging season-killing upsets over the Ducks in 2012 and 2013, and which arrived in Eugene in early November boasting the no. 1 total defense in the nation — he accounted for four touchdowns against a unit that didn’t allow more than two regulation touchdowns in any other game. So there’s certainly no argument to be made that Florida State (which ranks 51st in total defense and 30th in scoring D) presents a unique test that Mariota hasn’t yet passed. Now, for the blemish: By any measure, the nadir of Oregon’s season was the home loss to then-unranked Arizona on October 2, which resulted in season lows for yards (446), yards per play (6.03), rushing yards (144), yards per carry (3.5), and points (24), and generally left the Ducks looking unfit for a playoff run with matchups against UCLA, Washington, and Stanford looming. At the time, though, most of the blame for the lapse fell on an injury-ravaged offensive line, not on the quarterback, and it’s been smooth sailing on all fronts since left tackle Jake Fisher reentered the lineup the following week; the rematch against Arizona in the Pac-12 championship game was a vintage Oregon beatdown in which Mariota accounted for five touchdowns. To find anything resembling a cut-rate performance from Mariota himself, you have to go back to November 2013, when he was visibly limited by a gimpy knee over the final month of the regular season. In a game that could turn on one big mistake, every opportunity to push the limits of Mariota’s expansive comfort zone will be a significant one. The caveat, of course, is that the Seminoles will have to figure out a way to force Oregon into third-and-long in the first place, a Herculean task against an attack that averages more than seven yards per snap on first and second down. I’ll revisit that dynamic in more depth Tuesday, as part of a broader playoff preview that will give the Ducks’ tried-and-true ground game its due. In the meantime, suffice it to say that a healthy Mariota with the full playbook at his disposal is a worst-case scenario for any defense on any down. In fairness to Winston, no one really expected him to live up to the formidable precedent he set last year as a redshirt freshman, a debut that ranks among the finest individual campaigns in the history of the sport. Nor, as it turns out, did Florida State need a duplicate performance from its quarterback to repeat as the only undefeated team in the nation, albeit by significantly narrower margins in each game. 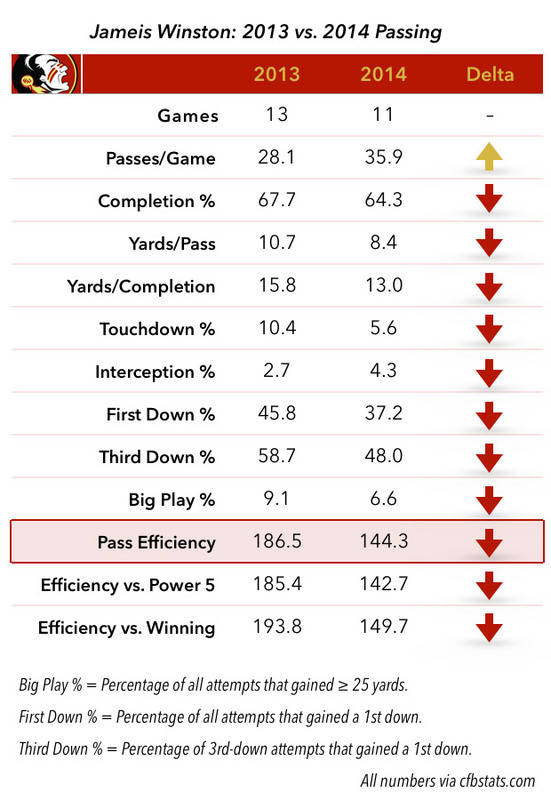 It was clear enough by midseason that Winston was a very different quarterback in 2014 than he’d been in 2013 — more mistake-prone, less lethal downfield — but that FSU would be all right as long as his personal baggage didn’t keep him out of the lineup.2 Winston hasn’t been the same player this season, but so far he hasn’t needed to be. Again, it’s not just that most of the numbers are down; of course they are. It’s that all of the numbers are down, some of them significantly, and the most relevant number — pass efficiency — isn’t even in the same zip code. (By comparison, the other quarterbacks who led their teams to the playoff, Mariota, Alabama’s Blake Sims, and Ohio State’s J.T. Barrett, were three of the four most efficient passers in the major conferences,3 with all three posting a rating north of 160.) No other quarterback in the ACC threw more interceptions or cost his team as many points as a result. If Winston had delivered the exact same stat line as a first-year starter, rather than as a reigning Heisman winner with championship credentials, it’s not hard to imagine him being cast as a weak link. At the same time, we’ve seen enough glimpses of the old, force-of-nature Winston when Florida State has needed him most — namely, in the second half of wild, comeback wins over NC State, Notre Dame, and Louisville — to leave the door open for a full-fledged eruption of his freshman brilliance. Against the Wolfpack, Winston countered a sloppy start by leading touchdown drives on five of FSU’s last six full possessions; the Seminoles rallied from a 17-point hole to win by 15. Against the Fighting Irish, he hit 15 of 16 passes for 181 yards after halftime and led three extended touchdown drives in a game decided by four points. Against the Cardinals, FSU erased a 21-0 deficit by hitting pay dirt on five of its last seven possessions, with three of those scores coming courtesy of Winston’s right arm as he hobbled around on a bad ankle. Only once did he look really bad, in a defensively driven, 24-19 win over Florida that set career lows for completions (12) against an FBS opponent, completion percentage (50.0), and efficiency (87.9), as well as a career high for interceptions (4). But that, too, was balanced the following week by Winston’s best start-to-finish performance of the year, a three-touchdown, zero-turnover outing against Georgia Tech in the ACC championship game. And again, Florida State needed every bit of it on a night that saw the defense ripped for 465 yards and 35 points. Every time the Noles have veered too close to the brink, Winston has been there to keep them from careening over the edge, and vice versa. Normally, this kind of analysis doesn’t leave much room for extolling the virtues of the “clutch gene” or whatever vague, objectively meaningless term you prefer, and neither does Las Vegas: As of Sunday night, the major oddsmakers listed Oregon as a nine-point favorite precisely because the Ducks’ fate never hinged on down-to-the-wire heroics. 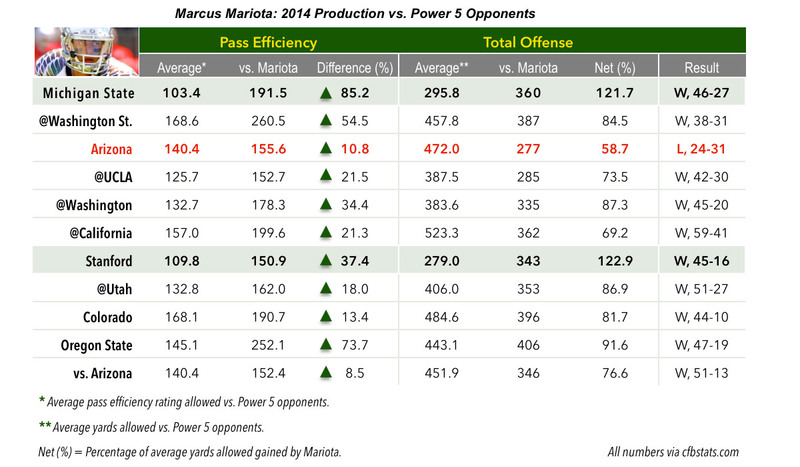 Oregon has been the superior team to date, and Mariota the superior quarterback. At some point, though, FSU’s finely honed survival instinct began to look like a genuine asset, if only because of what it suggests about the long-term potential for a team whose worst days still ended in victory. It’s entirely possible that the Seminoles and their mercurial leader will finally suffer the comeuppance that should have arrived weeks ago and was delayed only by sheer, random luck. It’s also possible that their best is still in front of them, and that it’s better than anyone else’s. If both quarterbacks come out Thursday on top of their game, it’s still possible that even Mariota’s celebrated polish could be tarnished by Winston in peak form. As a group, Heisman voters listed Mariota first, second, or third on 95 percent of all ballots submitted, a record for the award. And sometimes even when it did. Along with USC’s Cody Kessler. Premier League Winners and Losers: Special Boxing Day Edition!